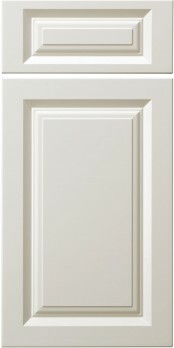 Using different cutter profiles, the 10SQ5 (MDF) door was designed with more detailed panel raise profile & framing bead profile than the similar 10SQ1, 10SQ2, & 10SQ3 doors. 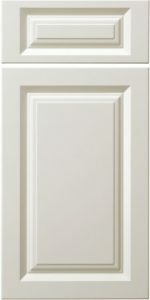 Using one-piece, solid MDF (Medium Density Fiberboard) construction this door appears similar to a wood traditional raised panel door but provides the benefits of MDF when used in a painted kitchen. Available in painted MDF using any of our Colortone (CWS) paints, custom Prism (Sherwin Williams) paint collection, or in Primer (customer to paint). Also available in raw, unfinished (none – finished by customer) MDF. The cross-section below is an example of how your door will look, but any profiles you choose will determine the final look of your door. B-2, C-2, H-2, L-034, L-059, L-149, L-253, L-382, L-686, L-803, L-1160, LC-2, ME (Machined Edge), PRS-2, & V-2. None - Design Specific, no options. Yes - Standard lite configurations only. Yes - Apply over plywood or 1/4" MDF panel. Yes - Hinge boring is automatic when ordered with RTA cabinets, but no hinging can be requested. If ordering doors only, hinging must be specified. Sign up to receive the latest news, promotions, and design tips from The Cabinet Joint.